An introduction to computer programming, using the easy, yet powerful, Python programming language. Python, a cross-platform language used by such organizations as Google and NASA, lets you work quickly and efficiently, allowing you to concentrate on your work rather than the language. 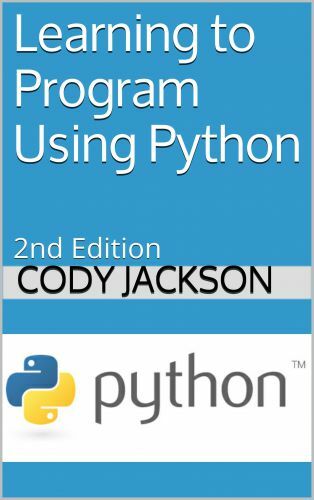 The core Python language (both versions 2.x and 3.x) is discussed, as well as an introduction to graphical user interface creation. The ideas covered in this book provide the reader with many major programming topics, applicable to a wide variety of programming languages. After reading this book, the reader should be able to quickly create simple to medium-level programs and be prepared to tackle more complex programming tasks. Cody Jackson has been involved in the tech industry, directly and indirectly, since 1994. He worked at Gateway Computers as a Lab Technician prior to joining the Navy. In the Navy, he served on submarines as a radcon technician and nuclear chemist before changing to the Navy's IT field. He has worked as a programmer, project manager, help desk technician and supervisor, security manager, and system administrator. He holds an AS in Electromechanical Technology, a BS in Computer Engineering Technology, an MS in IT Management, and is a Ph.D.-candidate in IS/IT Management.